GRAITEC, an international BIM and CAD software developer for AEC, and Autodesk® Platinum Partner in US and across Europe, is delighted to announce that it acquired 100% shares of B&L CAD Systemhaus GmbH, Hannover, Germany on Friday March 31th. This will significantly enhance the GRAITEC Group presence especially inside the DACH region and strengthens the European Platinum partnership with Autodesk. Founded in 1997, B&L is based in Hannover with 35 employees and six regional offices throughout Germany: Hannover, Kiel, Hamburg, Bremen, Siegen and Essen. B&L is an Autodesk Gold Partner and is active in both the Manufacturing sector as well as the growing AEC market place. B&L has over twenty years’ experience in the sale and implementation of CAD and BIM solutions, is an authorized Autodesk Training Center (ATC) and is also part of the Autodesk Developer Network (ADN). GRAITEC has had an established market presence in Germany since 2002 through its subsidiary “GRAITEC Innovation GmbH” and is a key player with a strong focus on the Steel Industry market sector selling Autodesk Advance Steel software, as well as providing Advance Steel training, support consultancy and development services. GRAITEC has purchased B&L to reinforce its position in the BIM market and contribute to its considerable growth throughout the Autodesk VAR network and DACH market region covering Germany, Austria and Switzerland. This move will provide significant benefits to B&L customers with the addition of the GRAITEC product line, most specifically the GRAITEC PowerPack for Revit – an extensive range of unique tools and functions designed to improve productivity when working with Autodesk® Revit®. PowerPack for Revit available exclusively from GRAITEC. GRAITEC acquired 100% of B&L shares on March 31th 2017. The price of the acquisition has not been disclosed. For the time being, B&L will continue to operate under the B&L brand, maintaining its working principles for clients and partners. In a second phase, it is planned to merge the two German operations under the single Graitec brand. B&L CAD Systemhaus GmbH, an Autodesk Gold Partner, was founded 20 years ago by experienced industry professionals. Driven by the founding principles of Integrity, Professionalism and Dependability, B&L offers a variety of Autodesk Solutions and services, including: consultation, implementation, training, and technical support. Since its inception, B&L’s’ innovative approach has been to proactively focus on our clients’ dynamic needs with flexibility and resourcefulness. B&L’s’ loyalty to our clients and our tenacious desire to become creatively involved in their success embodies our core business values and has established our reputable leadership in the industry. GRAITEC, an international BIM and CAD software developer for AEC, and Autodesk® Platinum Partner in US and across Europe, is delighted to announce the acquisition of the Russian engineering and consulting company PSS. This will significantly enhance the GRAITEC Group worldwide portfolio and its focus on developing software for streamlining BIM workflows. Founded in 1994, PSS is based in Saint Petersburg with 43 employees and three regional offices throughout Russia: Tula, Krasnodar and Novosibirsk. PSS specialises in implementation and expert technical support for BIM solutions in the design and construction, has over twenty years’ experience of PDM implementation in the AEC Industry and is also an Autodesk Silver Value Added Reseller (VAR). GRAITEC was already operating in Russia since 2009 through its subsidiary “GRAITEC Russia” with a focus on the Steel Industry market segment, especially by selling and servicing the Autodesk Advance Steel Product. As of December 2016, GRAITEC has purchased PSS to reinforce its position on the BIM market and contribute to its considerable growth throughout the VAR network and CIS market covering Russia. This move will provide significant benefits to PSS customers with the GRAITEC product line, most specifically the GRAITEC PowerPack for Revit – a range of unique commands and functionalities designed to improve productivity when working with Autodesk® Revit®, exclusively available from GRAITEC. GRAITEC has acquired 100% of PSS shares on December 29th 2016. The price of the acquisition has not been disclosed. For the time being, PSS will continue to operate under the PSS brand, maintaining its working principles for clients and partners. GRAITEC, an international software developer of BIM, CAD and structural analysis solutions, and global Autodesk Reseller across AEC and MFG sectors, announced today that it acquired 100% shares of Total CAD Systems, Inc., Houston, Texas, USA on Wednesday September 30th for an undisclosed price. The acquisition of Total CAD Systems, Inc., stands testament to the Group’s long term commitment to its customers and widely publicized rapid growth strategy. GRAITEC Group is now uniquely the only Autodesk Platinum Partner operating across United States and Europe. Total CAD Systems, Inc. brings with them over 200 years of collective industry knowledge and has a proven track record of delivering first class quality service and high customer satisfaction. This outstanding customer service and their affiliations with the Texas Society of Architects, Structural Engineers Association of Texas and American Society of Civil Engineers remain a priority at GRAITEC and Total CAD Systems, Inc. Customers can be assured this will continue as the team remains unchanged and new staff are brought on board. Now with the full support of a major international group, Total CAD Systems, Inc. will gain an extended capacity to deliver a new range of professional services around BIM and deliver more value to customers with an extended portfolio of unique complementary products. An increased investment capacity will, in time, enlarge the operational area and expand focus to include advanced simulation and fabrication management systems to better serve current and new customers. Total CAD Systems, Inc. will continue to operate in the US under its own brand, maintaining its strong position as an Autodesk Platinum Partner (VAR) while GRAITEC continues to operate across the US and Northern America as an Autodesk ISV partner for Advance Steel. About Total CAD Systems, Inc.
GRAITEC is pleased to announce the acquisition of HPC-SA (High Performance Computing – Simulation Acceleration), and its award winning thermal simulation software ArchiWIZARD. The acquisition was closed on Thursday October 23rd in Toulouse (France). Financial details have not been disclosed. This acquisition of a widely recognized, award winning cutting edge building performance and simulation software, including thermal, natural lighting, solar gains and renewable energy (Photovoltaic & Thermal), is another step towards GRAITEC’s ultimate goal of providing market leading BIM solutions for the construction industry and perfectly complements GRAITEC’s growing portfolio of BIM technology. Established in 2003 to promote very high performance simulation of wave propagation in areas as diverse as high definition computer images, electromagnetism, optics, acoustics and thermal radiation, HPC-SA quickly established themselves as industry specialists and went on to release ArchiWIZARD software, based on their RayBooster engine, (a real-time 3D energy simulation tool). ArchiWIZARD software platform evaluates real-time energy efficiency projects in direct connection with the 3D digital model. Incorporating raytracing technology, ArchiWIZARD uses the RayBooster engine to perform solar gain calculations (radiative intake, solar panels) and lighting calculations both daylight and artificial. This use of raytracing can take into account all masks in the most natural way (3D description) and extremely accurately creating a digital BIM model that can be used and reused throughout the building design cycle to optimize building performance. The HPC-SA Research and Development team will join the GRAITEC effort in designing and developing innovative software solutions contributing to BIM adoption by construction professionals around the world. Francis Guillemard, GRAITEC CEO, adds: “the strategy of GRAITEC is to become a global leading BIM provider, combining Autodesk and GRAITEC technologies for delivering real benefits to customers and accelerating BIM adoption around the world. The acquisition of HPC-SA, and their leading thermal simulation software, will significantly contribute to achieving this strategy enabling GRAITEC to expand their services and reach new customers“. GRAITEC, an international software developer of BIM, CAD and structural analysis solutions across the AEC sector, and global Autodesk Reseller is pleased to announce the acquisition of Robobat Polska, based in Poland. The acquisition was closed on Thursday October 2nd in Krakow (Poland). Financial details have not been disclosed. The acquisition of an Autodesk Gold partner will reinforce the position of GRAITEC on in the BIM market and strengthen its direct sales network in central Europe. It will also significantly reinforce the Autodesk partnership. A predominant player on the Polish market and historically focused on AEC* and BIM*, Robobat will continue to sell and support Autodesk BIM solutions including Advance Steel and Advance Concrete, as well as GRAITEC complementary BIM software and flagship structural analysis software Advance Design. This acquisition will also allow International Robot Structural Analysis users to benefit from the experience of a strong structural analysis specialist operating for more than 25 years in this market. The Robobat Research and Development team will join the GRAITEC effort in designing and developing innovative software solutions contributing to BIM adoption by construction professionals around the world. Robobat customers will benefit from the strength of a strong international partner and will be able to access international support in multiple languages, and countries, delivered by an experienced company with over 330 professional employees worldwide. They will also be able to access GRAITEC’s range of structural BIM solutions including powerful add-ons that compliment Autodesk technology. Andrzej Niznik, Robobat Polska CEO comments: “this is fantastic news for Robobat Polska customers. They will keep getting the best in class service from the Robobat Polska local team, but they will also benefit from the GRAITEC product portfolio extension and from the robustness and resources of an international group“. Francis Guillemard, GRAITEC CEO adds: “the strategy of GRAITEC is to become a global leading BIM provider, combining Autodesk and GRAITEC technologies for delivering real benefits to customers and accelerating BIM adoption around the world. The acquisition of Robobat Polska, leading Autodesk partner in Poland which is the biggest central Europe country, will significantly contribute to achieving this strategy. Robobat and GRAITEC also have a long common history in Europe and I am totally convinced that the synergy between our 2 companies will be extremely positive for customers wanting to benefit from BIM for increasing competitiveness“. Founded in 1989, ROBOBAT Polska is devoted to supporting the adoption of BIM by delivering a comprehensive service including software solutions for the design process, project workflow and analysis, to integrated hardware solutions, data management, customized training and engineering project assistance. Robobat Polska is an Autodesk Value Added Reseller with a Gold tier status and has 6 Autodesk recognized specializations in Consulting, Product Support, Structural Engineering, Process Plant, MEP System Engineering and Simulation. The company is an Autodesk Authorized Training Center and member of Autodesk Developer Network with Preferred Industry Partner status in Structural Engineering. GRAITEC, an international software developer of BIM, CAD and structural analysis solutions across the AEC sector, and global Autodesk Reseller is pleased to announce the acquisition of ERA3, based in Italy, and its well established Fabrication Information Management software E3Workshop and E3DSTViewer. This strategic step for GRAITEC builds on an already strong position in the steel market place offering steel customers, with or without 3D steel detailing software, an integrated fabrication management solution to manage all aspects of production, be it NC-automated or manually carried out procedures. GRAITEC continues to strengthen its dominant position in Construction technology solutions across Europe and the ambition of both companies is to provide superior manufacturing management software for steel construction, and also expand development to address the worldwide market. This acquisition sees Graitec establish itself as one of the only software players able to provide a global solution for steel fabricators and detailers, addressing their detailing challenges with Advance Steel®, and now E3Workshop for optimized fabrication management and an end-to-end streamlined workflow. For 4 years, ERA3 Italy has been developing, installing and customizing its software for fabrication and workshop management to meet the needs of its customers in an extremely competitive and time sensitive market sector. Working with all leading CNC machines providers and all compatible with all major 3D Steel detailing software systems, ERA3 software is available in English, Italian, Portuguese, Spanish and French (soon German) and has been used successfully by customers in these respective regions. 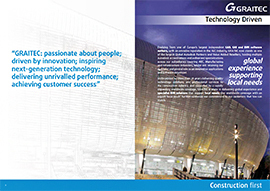 Founded in 1986, GRAITEC is a leading global AEC solutions developer and provider, delivering dedicated localised BIM software technology and services to construction industry specialists to maximise productivity, efficiency and performance with a high level of expertise in structural engineering, fabrication and detailing. Used by more than 40,000 professionals worldwide, GRAITEC solutions helps in creating outstanding projects: Coeur Défense tower, Stade de France stadium, Cairo Subway, Düsseldorf International Airport, Băneasa Shopping City in Bucharest, Milano Fair, etc. The GRAITEC Group employs more than 210 highly qualified construction specialists working in 14 locations and subsidiaries (France, Germany, Italy, United Kingdom, Czech Republic, Romania, Russia, Singapore, India, Canada and USA). GRAITEC also delivers its solutions with the support and collaboration of more than 40 international Value Added Resellers. Founded in 2011, ERA3 is an innovative company based on the talent and experience of its members in the software development, steel construction, engineering and workshop management. Over the years, ERA and its research team have brought several innovations to the industrial sector of the steel structures with some real technological milestones for the industry. ERA3 offers advanced software products and services for the steel construction Companies providing an added value to the customers and a set of complete solutions for an efficient production management of steel structures. GRAITEC has announced a strategic acquisition of Autodesk Gold Reseller MicroCAD (through its UK Subsidiary Adris Ltd.) The addition of MicroCAD to the GRAITEC family stands testimony to the Groups long term commitment and rapid growth strategy. Adris Ltd, already a highly respected Autodesk Platinum reseller in the UK supplying design software and services continues to grow its UK base, and through this acquisition aims to perpetuate growth by providing sales, support & consulting services across the whole of the UK via five strategic locations ideally placed to offer the best possible service to its customers nationwide. MicroCAD Ltd is a full service provider for Autodesk products for the Architectural, Construction Engineering and Mechanical industry markets. With nearly 30 years’ experience, MicroCAD has the in depth knowledge to develop tailored solutions and then supply, install, support and provide training and consultancy services to help its customers achieve maximum results. As a growing company MicroCAD is already an Autodesk Gold reseller and from this acquisition all of MicroCAD’s customers will benefit from coming under the Adris umbrella of being a Platinum Autodesk reseller offering the very best service and support globally. Francis Guillemard, CEO and founder of GRAITEC commented “The acquisition of MicroCAD will benefit all UK customers needing first class expertise and services around Autodesk products. The acquisition contributes further making GRAITEC a leading Autodesk European partner and significantly reinforces the position of the group on the construction engineering and BIM market“. Steve Houlder, Managing Director of Adris Ltd, stated “The synergies between the two companies will ensure no matter where the customers location they will never be far away from our five strategic locations, and the high level of customer service will allow for continuity of service. By adding MicroCAD, it affirms our position in the UK as one of foremost providers of Autodesk software and consultancy. We look forward to welcoming all customers and staff into the fold“. Neil Wright, Sales Director of MicroCAD comments “This is great news for all MicroCAD existing staff and customers. The joining of two of the top UK resellers together will provide an even higher level of service and expertise supporting customers large and small across the whole of the United Kingdom“. The combined company will have a turnover in excess of £17M with over 70 staff supporting 1000’s of customers across the UK. The companies will continue to trade under their respective brands until the full integration is complete.